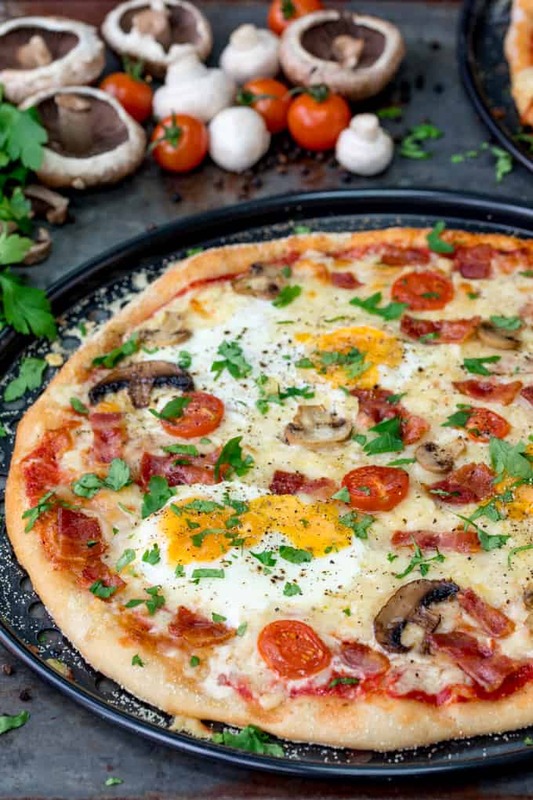 Home > Breakfast & Brunch > Breakfast Pizza – A Weekend Breakfast Treat! 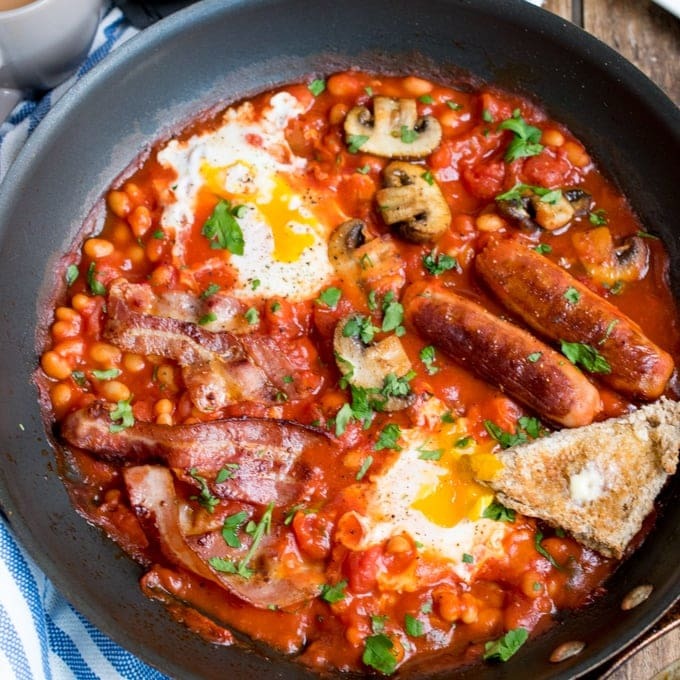 Not just any old pizza – this weekend breakfast pizza comes with the full-English works! Bacon, tomatoes, mushrooms and dippy eggs! 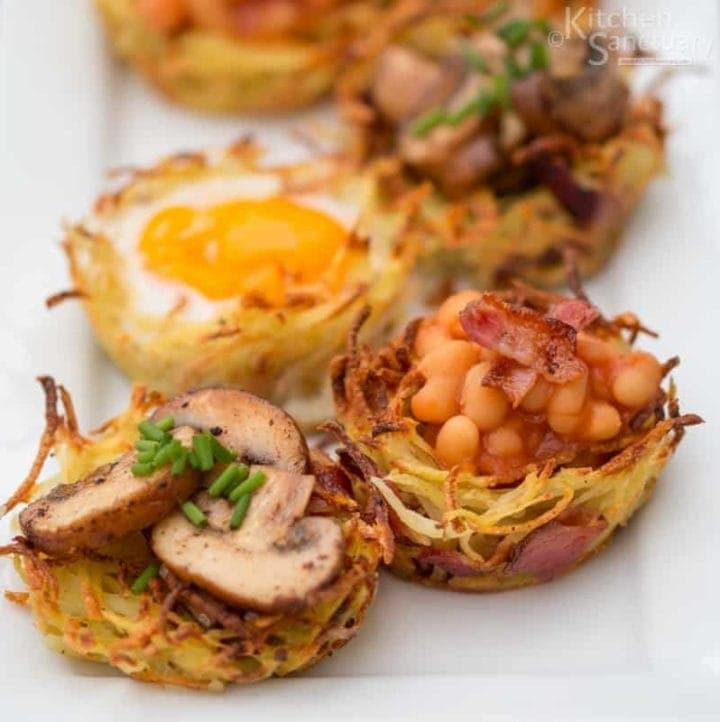 A fab breakfast treat! 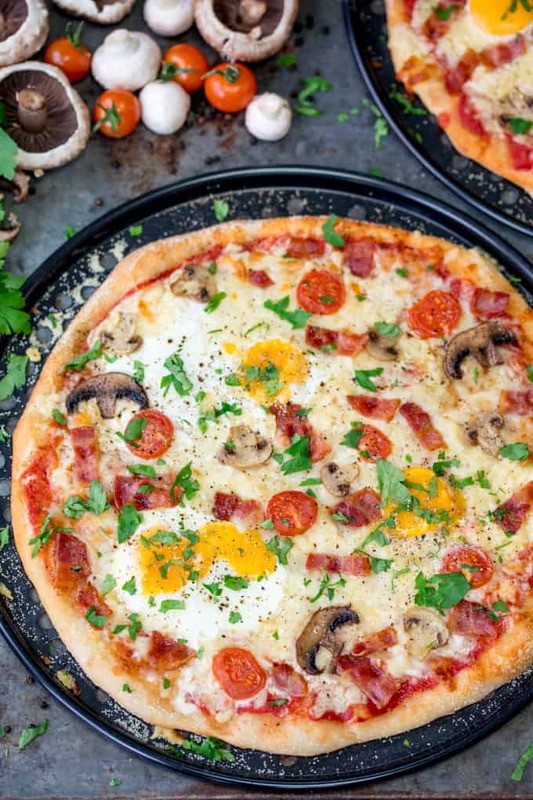 Check out my tips for getting a runny egg yolk to dip those pizza crusts into! Hope you guys have had a glorious Easter Week! We spent a good chunk of it in Wales, with no Wi-fi or phone signal (unless you count standing on one leg in one particular spot of the caravan with the phone pointed in a very precise direction, and not breathing – lest that one bar needed to send a text message disappears). It was probably a good thing – it’s just too easy to start scrolling through one’s phone 379 times a day. Holidays should be a time for relaxing and reconnecting. One thing I love about being away is the food. Nice restaurants, ice cream parlours (I had the most amazing coffee ice cream in Abersoch. Chris had hot cross bun ice cream! ), cones of chips by the sea. Bliss! I also love cooking whilst we’re away. Sounds like a bit of a busman’s holiday, but we nearly always go for self catering accommodation, just so we can all cook and eat together. Our lazy breakfasts tend to happen on Sundays, as Lewis has football for most of the morning on Saturdays. Chocolate chip pancakes or rounds of bacon butties are pretty high on the request list, but sometimes it’s fun to experiment with something a little bit different. No, not the reheated leftovers from a previous evening takeaway. We’re talking a fresh-from-the-oven cheesy pizza, topped with crisp bacon, butter-basted mushrooms, lightly roasted tomatoes and dippy eggs. Prestige sent me a couple of their pizza trays (which incidentally were less than half price when I checked this morning), and what a difference they make to a make-at-home pizza! 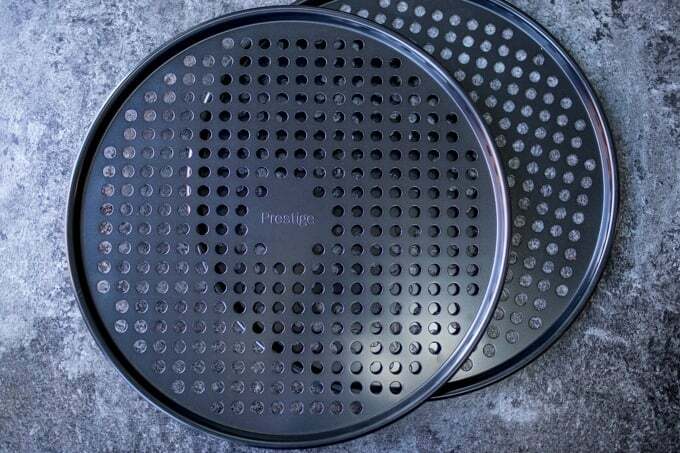 The holes ensure even heat distribution for a beautifully crisp base, they’re totally non-stick, and they can even go in the dishwasher (result!). They’re pretty heavy and feel good-quality. No warping in the oven (don’t you just hate it when you buy a new tray, and minutes after it goes in the oven you hear that familiar ‘twang’ as it buckles out of shape. Grrrrr). Cook your bacon before sprinkling on the pizza. 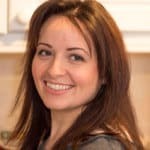 I find it best to cook the bacon until it’s just a little less cooked than you usually like it (you can cook it in the oven, on the pizza tray, whilst you’re rolling out your pizza). The pizza is only in the oven for about 10 minutes, and the cheese helps to protect it from the heat, so it will only cook a little bit more once on the pizza. I’ve tried adding raw bacon on top, and it just doesn’t achieve that perfect level of crispness. I’ve also tried crispy bacon, but it overcooks. Another option is to cook bacon to your exact liking, then sprinkle it on the pizza for the last minute of cooking – just to heat it through. Get that lovely grainy crust that you get from pizza restaurants by sprinkling the edges of your rolled out pizza dough with semolina before adding the toppings. For the vegetables: Use cherry/grape tomatoes, either halved or quartered. A sprinkling of black pepper, and they should cook to lightly roasted perfection on top of the pizza. For perfect mushrooms, slice them and sprinkle on top of the pizza, then brush with a little melted butter or oil and sprinkle on a little salt and pepper. Every piece of mushroom will be golden, buttery and delicious (rather than those dry wrinkled mushrooms you get from just sprinkling them on top). The egg is the trickiest bit to get right on this pizza. 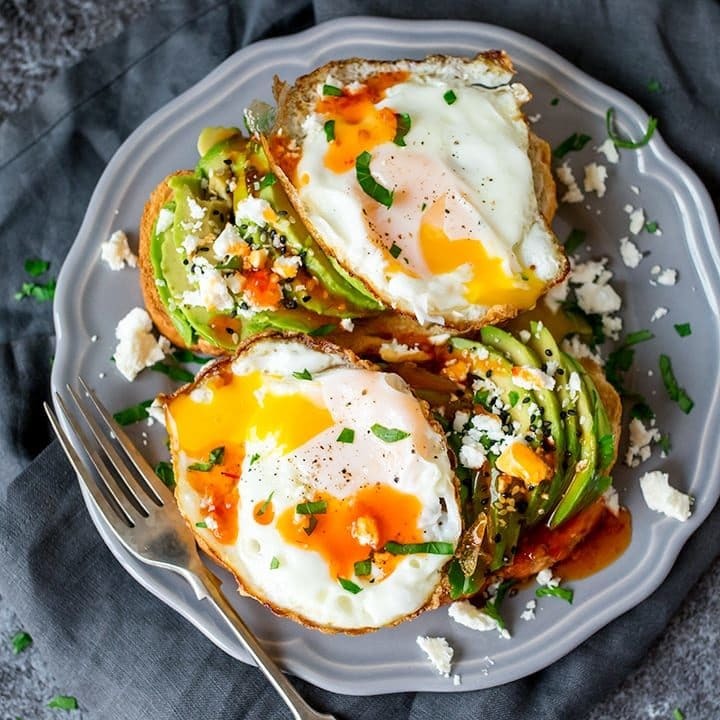 If you don’t want runny yolks, then no problem! 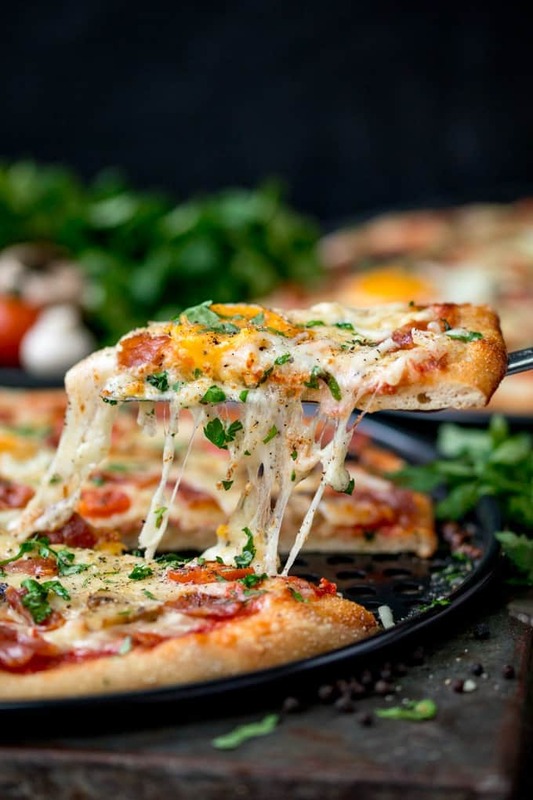 Just cook the pizza in the oven for 10-12 minutes until the whites and yolks are firm, and the cheese has melted. But who am I kidding here! Runny eggs are the best! My tips for this are to use large eggs, with bigger yolks (bigger yolks = longer time to set, which is what we want). Crack the eggs, then drain off half the white. This should ensure your egg white will be fully cooked, as there’s less of it to cook. Also try to make a little well in the cheese, then add the egg into the well carefully. This should protect the egg a little, whilst the cheese melts. After 10 minutes in the oven, you should have a crispy crust, and eggs that are still a little runny. If you want to make double sure that you get runny eggs, then cook the pizza with all of the other topping on for the first 5 minutes, then add the eggs for the last 5 minutes (again, be sure to drain off half the egg white first). 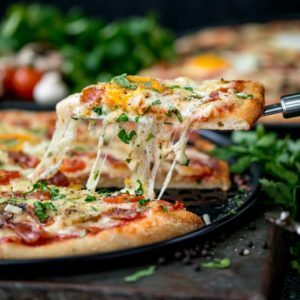 Breakfast Pizza - A Weekend Breakfast Treat! Preheat the oven to 210C/450F. Once preheated, place the bacon on the pizza tray and cook for 5-8 minutes, until cooked, but not quite crisp. Remove from the oven and slice. Put to one side. Whilst the bacon is in the oven, roll out the pizza dough, dusting with the flour, so it doesn't stick to your work surface,. It needs to be around 1 inch smaller than the pizza tray. You can buy ready-rolled pizza dough. Sometimes this is rectangular shaped. If it is, you can squash it back into a ball and re-roll to a round shape. Dust the edges of the pizza dough with the semolina. Transfer the pizza to the now-empty, but still warm pizza tray. Spoon on the passata and use a spoon to spread all over the pizza base. Leave a thin border of the dough showing. Sprinkle on both of the cheeses, and make 3 wells in the cheese for the eggs*. Crack an egg into a small bowl and discard half of the egg white. Carefully pour the egg into one of the wells and repeat with the other two eggs. Scatter the tomatoes and mushrooms over the pizza, then brush the mushrooms with the melted butter. Arrange the cooked bacon on top of the pizza and sprinkle on the salt and pepper. Place in the oven to cook for 9-12 minutes, until the crust is browned, the cheese has melted and the egg white is cooked. * It can be difficult to ensure the egg yolk stays runny whilst the pizza is cooking. If you want to ensure this, cook the pizza with all of the other toppings first for the first 5-6 minutes, then add the eggs for the last 5 minutes. 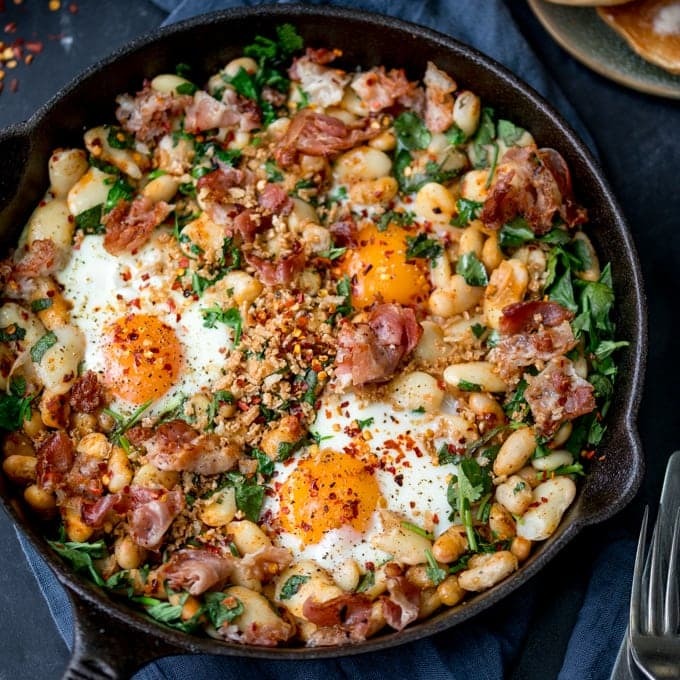 WOW this brings together 2 of my favourite meals (Breakfast and Pizza) 🙂 Pretty sure this means i can have this for Breakfast Lunch and Dinner now hahaha. Thanks for sharing, i will definitely be trying this.